For the experiment, we were three people to judge the quality of the sweetener between 0 (awful) and 10 (awesome). The outcome is interesting. Marple syrup and agave syrup seem to be the best, closely followed by Xylitol. Stevia is ok (here I used dried and grinded Stevia), however, its sweetnes does not seem to get a full and round taste. Its taste is rather sharp and if used too much, it can be disturbing. Maybe it would be better with fresh stevia? Molasses has not been judged well, as it comes a long with a very strong taste and not so much sweetness. 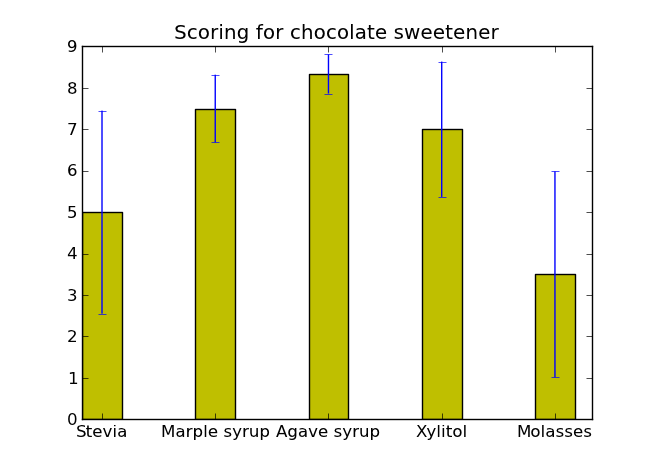 For my last chocolate preparations I was using Xylitol (with a bit of stevia) as it seems to be healthywise (especially for the teath) the most advantageous sweetener. One downside during the experiments was that its crystals did not melt in the chocolate. Blending chocolate and Xylitol together at a high speed before pouring them into the molds has proven to be helpful. I like the final outcome . Maple syrup or is it a specialty item?